Moving from one place to another is a task that few people look forward working too. Between organising, packing and up to transporting your possessions, it’s one of those chores that you want to get done as quick as possible. Luckily, you now have a portable storage option to make your move a lot easier than before. Yes, using one is the best option you can count on. These units are dropped off at your house and you can fill it at your leisure time. Furthermore, when packing is all done, you can then ask the storage company you hire to pick it up and transport to their facility. Hence, when you get one to support your move, you will quickly realise you have found the best portable storage option. So, in order for you to find the best service provider for this endeavour, be guided by the following questions. 1. What exactly a portable self storage unit is? Portable storage unit or modular self storage unit is essentially self storage boxes that you can easily rent from a self storage company. They are designed so you can fill them up conveniently. In fact, each module has enough space inside that can hold the contents of one or two rooms. 2. Do I need to worry when transporting my portable storage unit? Absolutely not. Once you have filled the capacity of your portable storage option, all you have to do is to call and set your convenient schedule. Your chosen service provider will then pick-up your unit. You can always choose to have them delivered immediately or you can even delay a few days. In fact, you can store your stuff indefinitely at the self storage facility and have it back whenever you want to. And if you’re storing for your office relocations, then have it at your most convenient time. 3. Is there a right or wrong way to fill up a portable storage unit? Yes, there is. As you do all the moves, you would want to organise your possessions and pack them properly to avoid any damages during the transportation. In that sense, it’s a good idea to purchase boxes with the same size so that you can stack them easily. Likewise, this can also reduce the amount of space in which your possessions can move around. Furthermore, it also ensures that you use the entire space efficiently. 4. Is a portable storage option a smart way to move? Yes, it’s the smartest way you could do to save not just your time but as well as your money. Majority of the people commonly use the traditional storage solution. Considering that, it is rather costly and inconvenient since you still need to rent a vehicle that would bring your possessions to your unit. However, with portable storage option, you can move and store your possessions the way you want it to be. You can pack and move your stuff at your most convenient time without spending too much money. Likewise, people that use it, find it less hassle which makes it more convenient. We all know that moving from one place to another is a devastating task. However, if you can properly evaluate the things you need to check during your move, things will go smoothly. Always ask the right question and see to it that you learn the things you need to know. 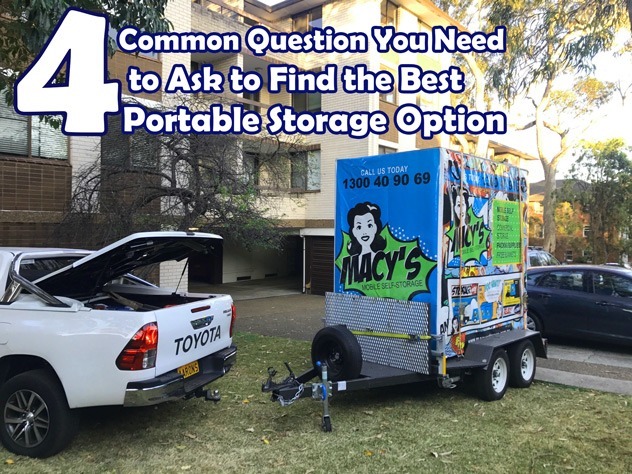 Above are the common questions that could help you out in finding the best portable storage option that suits your need. Want to learn more about portable storage unit? Macy’s Mobile Self Storage is here to give you more insights. Explore our entire website and check our other services offer that may fit your needs. And if you’re looking where to store your furniture while you’re renovating, read this article → Furniture Short Term Storage. This entry was posted in Storage and tagged cheap storage, Long Term Storage Sydney, Macy's Mobile Self Storage, Portable Self Storage Sydney, self storage, self storage sydney, short term storage sydney, Storage, storage module, storage sydney.